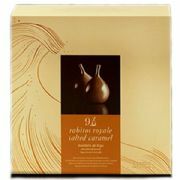 Dark Chocolate Leaves with Flor de Sal - premium quality 70% dark chocolate leaves with hint fine sea salt in a metal tin decorated with designs from the producer's old promotional posters, Chocolate Amatller an iconic Barcelona chocolate company since 1797. Made using Amatller’s own method of cocoa bean selection, roasting, refining and conching, the chocolate is characterised by an intense flavour, which has a long finish and an accent on toasted notes. 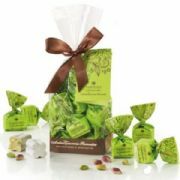 These chocolate leaves melt in the mouth with a creamy sensation and the aroma of roasted coffee and nuts, from which emerges the slightly salty taste of sea salt, bringing freshness and making the mouth water, taming the bitterness of the cocoa and making it more delicate. A delicious interaction between cocoa and sea salt. Ingredients: Cocoa Mass, Sugar, Soya Lecithin, Salt, Flavouring (Vanilla). Cocoa Solids 70% minimum. May contain traces of nuts and milk. Gluten free.